Commercial locksmith Easton PA whenever you need a professional and reliable commercial locksmith in Easton PA. We provide commercial locksmith services in Easton, alongside with an emergency locksmith services. In a moment you get locked out of your office, you feel very stressful. This is the reason why we provide commercial locksmith mixed with fast emergency locksmith service. 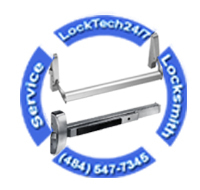 Business owners in Easton have already known the efficiency of LockTech24/7. This is why they repeat calling us anytime they may need a commercial locksmith for their business. At the same time, they can rest assured the job is done right and in a fairly timely manner. When you’re locked out of your commercial space, it could be crucial for your business. Healthy business should always be open in his trading hours. With this in mind, when you lock yourself out of your business, you can’t keep working for your money. This is the main idea why we take a business lockout call in Easton, very seriously. In this case, we give your call the first priority to get you back in your office. Commercial locksmith Easton PA at LockTech24/7 is experienced to handle any emergency business lockout call. Emergency Commercial Lockout Easton PA – Yes, this is one of our fastest emergency locksmith service we provide on a daily basis. Not just we are fast, but we also keep affordable rates. In the event of a business lockout, please call us as soon as possible in order to get the fastest office lockout service in the region of Easton PA.
U-Haul Storage Lockout in Easton PA – Are you locked out of your U-haul storage on Nazareth Rd of Easton PA? If so, you may know we are serving customers like you over and over again. Residents of Easton PA knows the courtesy of LockTech24/7 regarding unlocking U-Haul storage unit. Locked Out of File Cabinet in Easton PA – It must be remembered that there are so many styles, types, and shapes of file cabinets. That is to say, we have some of them stocked in our van, but we don’t have all of them. Yet, we are able to help with any task you may have with a file cabinet lock. Commercial Safe Lockout in Easton PA – Safe lockout is not an easy emergency locksmith service. Yet, we are able to help. Call our locksmiths when you need to unlock your safe, we can do that fast and easy. 24/7 Emergency Commercial Locksmith Easton PA is here for you. Please call us either for an estimate or reschedule commercial locksmith Easton PA. When you need emergency commercial locksmith service, we are here to help. Call now! We provide commercial lock services for business in Easton PA. This includes commercial lock re-keys, repairs, and replacements. In addition, we can also create a master key system, as well as installing access control systems. Tell us your commercial locksmith needs and we will furnish you a uniques solution specifically to solve your lock issue. Let’s check the condition of your locks and get brand new locks for your business. Lock Re-keys in Business in Easton PA-Lock re-key in a business is a routine you need to repeat once in a while. The reason for that is because there is always a change with your staff. New employees come, old employees quit or get fired. With this in mind, we recommend to re-key the locks of your business occasionally. Lock Repair of Business in Easton PA – Sometimes, a lock on your office door can suddenly break. The worse thing is this can happen just before you want to close your business and go back home. If this happens to you, don’t get frustrated, simply call our commercial locksmith Easton PA to repair your lock as soon as possible. Storefront Door Lock Replace in Easton PA – A storefront door lock is easy to repair when you call LockTech24/7. From time to time, you may have an issue with your storefront lock. For this reason, we recommend you to set up our phone number in your phone, so you can easily call us anytime you may have a problem with your storefront door lock. Key Extraction in Your Office in Easton PA – Also to extract a broken key out of your lock need skill and the right tools. We have key extraction kits to take out any broken key inside your lock cylinder. Call us now for fast emergency key extraction service in Easton PA.
Commercial locksmith Easton PA is ready for any locksmith project in your office, whether small or large. We can help your business, we can help you! Panic Bar (Exit Device) Repair or Replace in Easton PA – You can usually find a panic bar on the back door of your office. In some businesses, you can also find a push bar in the front main door. Yet, it doesn’t really matter which panic bar causes problems. We can come to check and maintain any panic bar you may have on your doors. Door Closures Repair in Easton PA – When you have a problem with a door closure above your door, it can jeopardy your business sales. In that case, you may call us to evaluate the problem with your door closure and to find the best solution to fix it. Installing a Buzzer System in Easton PA – A buzzer system or electric strike system is available when you call us. We come to take measurements and picture in order to fit the right buzzer system on your door. For this reason, please call us for an estimate and first appointment. We will take it from there. Call commercial locksmith Easton PA for any commercial locksmith task. Surprisingly, you would be amazed at our top-notch customer service. We are here for you!